The Mars, owned by the Coulson Group, will be a star attraction at AirVenture and will fly during at least some of the afternoon airshows, undoubtedly showing the fire-dousing ability of its 8,000-gallon tanks. 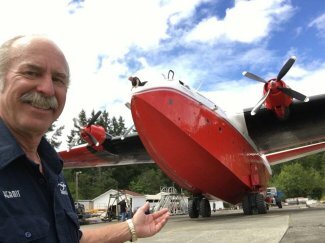 The aircraft has been used for more than 40 years in western North America as an air tanker but a change in tactics by firefighting authorities and the huge expense of keeping the Second World War-era aircraft airworthy have left it grounded for most of the past few fire seasons. Coulson is offering type ratings on the plane and looking for new revenue prospects for it on the Oshkosh trip. More than $1 million was spent getting it ready for the flight. Kermit will be interviewed at the Monday morning, July 25 Vintage in Review held at Interview Circle in Bill Rose Plaza. He should have some interesting recent stories to share. Plenty of bleacher seating. Interviews start at 11:00 am Monday through Friday. Plenty of bleacher seats.